One of the bestselling two-seater roadsters recently received yet another special edition in the UK. Dubbed the Mazda MX-5 Kuro Special Edition, the new addition to the already large MX-5 family brings along with it a handful of aesthetical changes both inside and out. The Kuro is available in both soft-top and hard-top flavors and both come with a different price-tag and slightly different features. The new model is offered with two engine variants, a 1.8 liter unit developing 126 horsepower and 123 lb-ft of torque, and a 2.0 liter four-cylinder engine developing 167 horsepower and 158 lb-ft of torque. The 1.8 liter unit is mated with a five-speed gearbox and it is available on the soft-top model. The 2.0 liter on the other hand comes with a six-speed manual transmission and is available only in the hard-top version. Performance wise the soft-top version can go from 0.60 in 9.9 seconds and has a top speed of 121 mph, whereas the hard-top version goes to 60 mph from a standstill in 7.9 seconds whilst boasting a top speed of 136 mph. 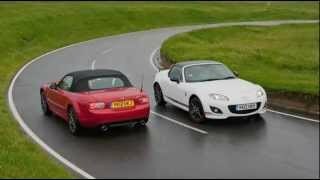 The MX-5 is well known for its balanced handling and high stability, all this being achieved with the help of features such as Dynamic Stability Control and Traction Control System. In addition, the 2.0 liter hard-top also comes with Limited Slip Differential delivering an even higher precision in handling, as well as a set of side air-bags for a higher level of safety. 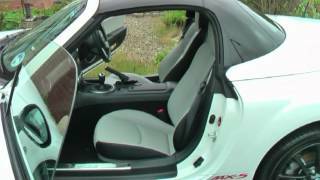 On the exterior the limited edition MX-5 comes with a new set of 17 inch alloy wheels and a new rear sport bumper accompanied by a larger sport exhaust system. Considering the fact that "Kuro" means "black" in the Japanese language (or "fuel" in Lithuanian, and who knows what else in other languages), the new special edition comes with a black roof and black door mirrors, and the 17-inch alloy wheels have also been painted in dark gunmetal. However, the Kuro does not come painted only in black and in fact the carmaker offers a choice of three colors including Red Mica, Brilliant Black and Crystal White Pearlescent. Inside, the roadster is offered with unique heated seats wrapped in Stone and Black leather, Stone leather door inserts and a silver interior deco panel, everything being contrasted by red stitching and red accents. Furthermore the special edition comes with a climate control air-conditioning system and alloy pedals. 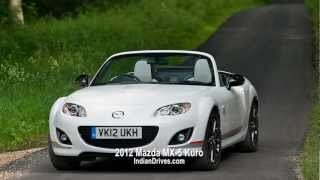 In case the Mazda MX-5 Kuro Special Edition 2012 caught your attention then grab it while it's hot because only 200 soft-top units will be available in the UK for the price of £18,495, and only 400 hard-top variants wearing a price-tag of £21,995. That's not a lot for a limited-edition model considering the fact that the standard BMW 1-Series Convertible would set you back roughly £25,000.